The Escapist was a site that I used to respect. It was video game commentary for adults. Perhaps it was always a bit highbrow but there was enough meat in the philosophizing to give it purpose. Nowadays the site has evolved into a video channel, more or less, with articles and related “news”. While some might bemoan the change, it does fit in with a more modern internet and I can’t really blame the shift. These days, however, The Escapist is starting to employ link bait techniques. That is, using sensationalist headlines that overblow anything the article actually talks about solely for the purpose of attracting attention. "Games Aren’t Good For Adults" claims a news link. Clicking through quickly reveals the true headline to be "Games Aren’t Good Enough For Adults", which means something completely different. Or what about the “Avengers Cost NYC $160 Billion in Damages" story, where reading the article explains that this is the amount of money that a real life execution of the fantasy plot would actually cost the city. Is the website hurting that much for ad revenue? Please treat us like adults. Right now the headlines are going the way of Yahoo!. For a bit of background, let me explain that I am a Generation X internet user. This means at one point I used Yahoo! as my main hub for searches. I am a pretty brand loyal type of guy, and while others were moving on to the newfangled Google, I stayed true to the old guard. Did it matter that the new upstart was sleek and clean and didn’t have a page littered with services? Sure, that’s a big deal, but I wasn’t naïve in thinking that Google would never build into the same type of thing. In point of fact, simple searches are often beleaguered with pandering to join Google+ or the like these days. But that’s not why I left Yahoo! years ago. 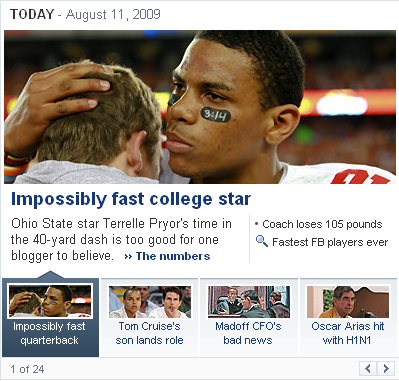 This is old Yahoo!. You can see the queue of news stories below. All of these have legitimate reporting value. The lead story, however, is a bit curious. Look at that picture of meteors. 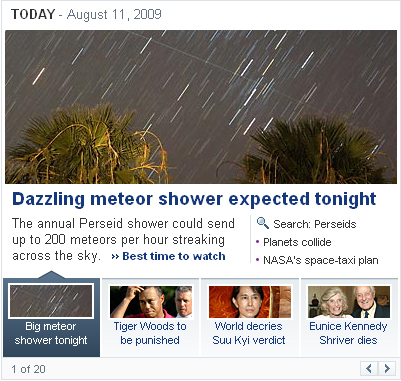 A dazzling meteor shower “could send up to 200 meteors per hour streaking across the sky.” Cool! Wait a minute- 200 per hour? What is that, about 3 meteors a minute? Isn’t that an awfully deceptive image for 1 meteor every 20 seconds? Up next is this investigative gem. A 40-yard dash time “is too good for one blogger to believe.” What? This is a “news” story about a blog that takes offense at something? That’s like the AP running an expose and linking to my site because I said Ghost Hunting Shows were stupid. There is no journalistic value to that at all. Up next in Yahoo!’s cutting edge repertoire: a funny animal video. Ok, these light-hearted distractions will always find a way to people’s eyes. Let’s see what the once giant search engine headlines for the “Best videos of ‘09”. A deer walking through a cat door. Except that this video looks awfully familiar, and the timestamp of 1999 is a dead giveaway that this video is REALLY OLD. It was probably first seen on America’s Funniest Home Videos. How is this a best of video for 2009 exactly? It’s obvious at this point that Yahoo! is scrambling for page views. They don’t have any content so they are referring to opinion blogs and videos from last century to stay afloat. But what happens when even that isn’t enough? Will they just flat out make up facts? 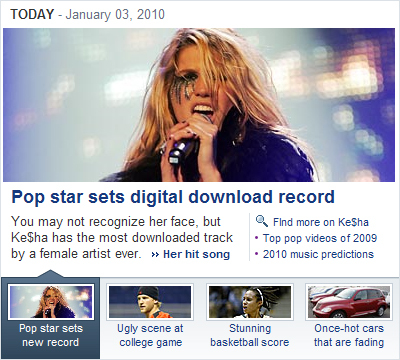 This Ke$ha headline explicitly states that she has “the most downloaded track by a female artist ever.” That is a pretty bold claim. Ever? Man, that is unbelievable. I mean, really, super surprising. Let me just read about that. Oh, I see. The reason I didn’t believe this fact is because is was completely untrue. The song wasn’t the most downloaded track by a female artist ever, it just had the highest weekly sum. That’s impressive for sure, but why the need to lie? Yes, you fooled me again Yahoo!. You got another link click. You know what I got? A new search engine. And that’s when I started using Google. So back to The Escapist and the internet in general. This kind of link baiting is a desperation move, a last ditch ploy to keep traffic up. What it most certainly is not is a viable long term strategy for providing readers with good content. One thing people seem to have forgotten these days is that respect is hard to gain but easy to lose. Selling it off for a few more years of profit may help the bottom line today but it does significant damage to an ailing brand down the road. Speaking of which, it’s almost time to find a new, improved, better search engine. Anyone have suggestions?